Concrete screed floor construction showing underfloor heating pipes installed. Close up of a concrete screeded floor preparation with underfloor heating pipe installed on top of insulation. The builder had laid the base concrete and prepared the floor for the installation of the underfloor heating by covering the concrete with high density extruded polystyrene. He did a great job, and used the correct insulation, i.e. high-density rigid insulation. Please contact us for information. Rather than mark out the partitions with a single row of bricks (a method chosen by some builders/as shown here), this builder chose to have the room partitions in place prior to our arrival. To provide ease of working the forthcoming concrete screed, he raised the partitions on blocks, leaving gaps for the concrete to move through. He then laid the required high density extruded polystyrene insulation. 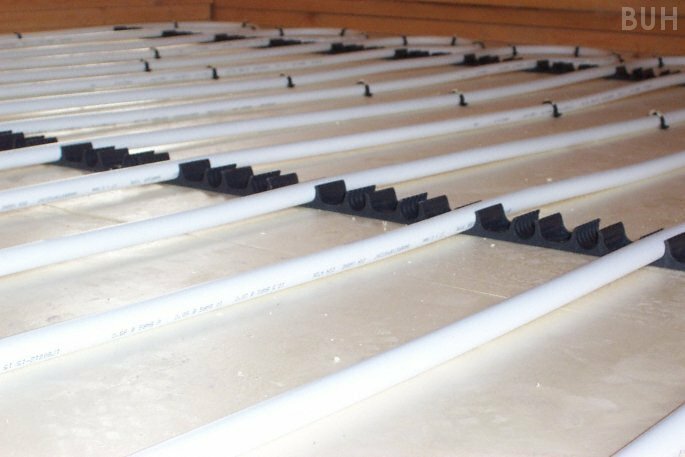 We always recommend that any property is at least wind and watertight prior to installation of underfloor heating pipes. It allows our installers to install your system without interruption from the weather, and also provides more protection for the installed components should there be any risk of the weather becoming inclement, which in this country is a more frequent occurrence than we'd prefer.